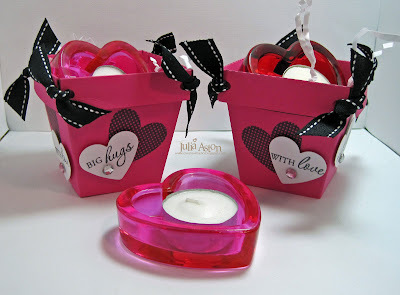 I have two final Valentine Crafts to share with you today that I'll be selling at my church. Both of them are completely copied from other people! (why re-invent the wheel right?!?) and I have linked to where I found them both. 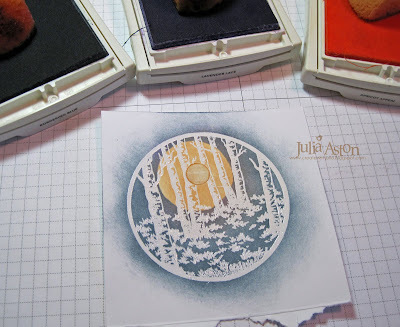 First are these adorable little glassine bags that I found on fellow Waltzingmouse DT member Jennifer's blog. The stamps are from the Sweet Hearts set. The glassine bags are from PTI. 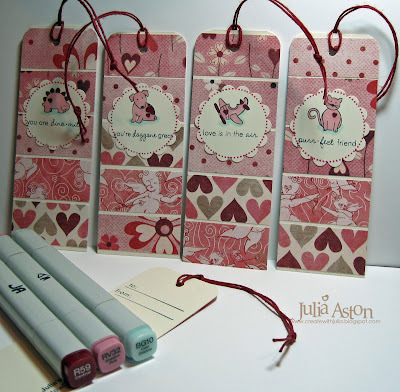 I found these cute Valentine Bookmarks on Mish's blog. I used My Mind's Eye/Irresistable and Basic Grey/Two Scoops for my designer papers. 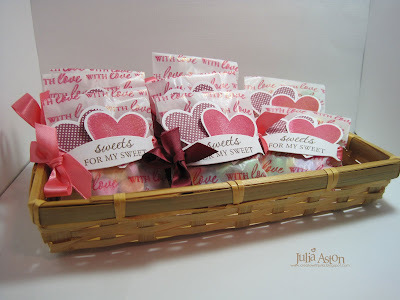 I used 5 designs of DP (four 1"x 8" strips of each) and a 12" piece of twine (Stampin Up) for each one. See Mish's blog for how to lay them out and cut them. The cute stamps are from PTI - Take Note and Tiny Treats Valentines. I used just 3 copics to color all the images - R59, RV32, BG10. Cute and simple and so pretty! My kind of craft! And here's some fun news! Claire is revealing 4 new stamp sets at Waltzingmouse on Thursday 2/4! Each day starting Sunday two of the design team members will be having sneak peaks on their blogs and Claire will be having them everyday! On Sunday - check out Belinda and Laurie. I'll be having my sneak peeks on Monday along with Anya. Today's Inspiration Challenge on Split Coast was the web site Espe. I looked at all the pretty wallets there and was inspired by the pink wallet with roses . 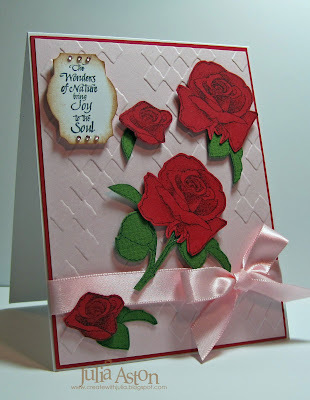 I used one long stem rose stamp from Rubbernecker Stamps for this card. I stamped the rose part several times on red card stock and then cut them out. On some, I only cut out the center bud of the rose. Isn't this a gorgeous rose - I love the detail on the stamping - I can just smell their lovely scent! Then I stamped the leaves and stem on Bazzill Green card stock and cut out diffferent pieces of it attaching them to the backs of the roses. They are all popped up on foam dimensionals . The sentiment is from a set called Petite Word Set. I only inked up the bottom half of this particular sentiment as that was all I wanted for this card. My background is the Diamonds in the Rough Cuttlebug folder. Well - I stayed up so late to do this challenge on Friday night - it is now early Sat morning and it's only 7 degrees outside! I'm so thankful that I'm in my cozy warm home! The Greeting Farm that is - here are 3 more cards I made for their fun CHA Relay Challenge. So many people participated in their challenges this week that their site kept crashing - so they had to stop before the week was over! Starting last Sunday they gave you a free digi image - and you had to load your card to their Galleria by 6 pm the next day in order to get the next day's digi image free! You can see my Day 1 card using Mer Ian here. The card above is from Day 2 - using Digi Charlotte - isn't she a cute little Chica?!? Day three was digi Toby Cub - how cute is this little guy?! And Day 4 -what turns out to be the last day - we got Prince Ian check here to get your own! Here's what I stamped on the inside. I'm so sad the challenges ended early - now what will I do!?!?! LOL! Come for Tea and a Hair Cut! You ink the stamp with Versamark - then over stamp it in a color using a flower stamp (or whatever) stamp it on card stock - and then clear emboss it. I love how it came out! The window and sentiment are also from Starving Artistamps/Doodle Factory. The story is that Rapunzle is a hairdresser in the castle and she's trying to drum up business. Hopefully this pretty wall will be inviting to people who walk by and they'll stop in for Rapunzle to cut their hair - ya think?? This also fits the Tuesday Doubledog Dare challenge this week where jdmommy (Anne) challenged us to use some kind of frame on our card. I used a window frame! 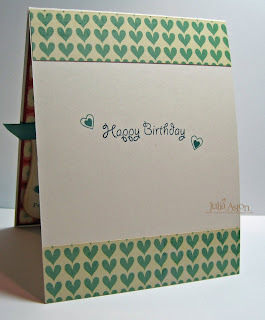 Claire's Birthday Waltzingmouse Blog Hop! 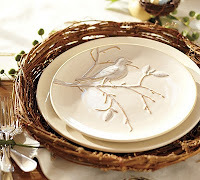 I am so thrilled to welcome you to the first Blog Hop of the Waltzingmouse Design Team! The team is excited to be doing this first hop in honor of our Claire - who's birthday is today!! whoo hoo! Happy Birthday Claire! Are you super surprised?!?!?! Our hop is starting with Anya - so if you just happened here because you love me (!) - please hop over to Anya first and come back to me in the proper order!! If you arrived here from Jennifer - you are in the right place! In honor of Claire's birthday - we are all making birthday cards using Waltzingmouse Stamps! 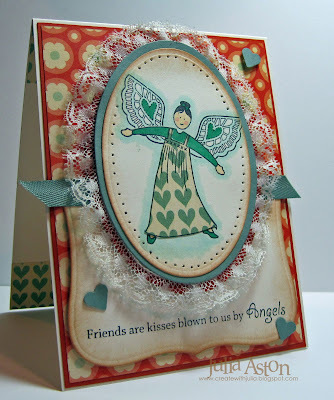 I just love this Earth Angel set - the angel has several sets of wings you can use and a multitude of sentiments for many different occasions. A very versatile set! The smocking at the top of her jumper is a separate stamp - how fun! I paper pieced her jumper and masked her body to stamp her wings. Here's a pic of the inside of my card. I used the Happy Birthday sentiment (of course! ), an outline heart and a cute little solid heart! I also used two strips of the same designer paper I paper pieced her jumper with. 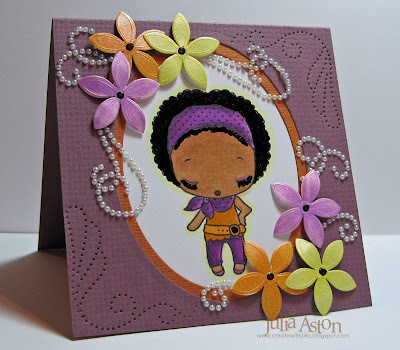 Now - hop on over to see what wonderful creation Laurie has to share with us! Here's the complete DT list in the order of the hop. Thanks so much for coming by today - and HAPPY BIRTHDAY, CLAIRE!! Yikes! I think I'm just getting this in under the wire! The Greeting Farm is having a fun CHA relay - they gave us this free digi print of Mer Ian and you have to post a card by 6 PM CST today to move on to the next round! I just saw this at work this afternoon and luckily I live in EST zone so I have a slight chance of getting it posted by the deadline. So - without further ado - here is my Mer Ian Card. Isn't he just the cutest little guy? I used Karen's Sweet Sunday sketch for my card. This Cosmo Cricket is just perfect isn't it - and I also added blue dew drops like underwater air bubbles! I even added a tiny little gem to Ian's little belly! Paper: white, plum pudding - PTI, Ballet Blue - SU, DP Cosmo Cricket/Snorkel/ Schools out and Carbinations. I chose her Fast Black Magic card to CASE. 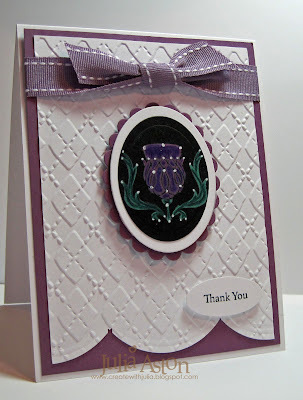 I thought this pretty thistle from the Celtic Heritage set by Waltzingmouse Stamps would work perfectly with Karen's pretty card design. I changed the colors, the stamp, added a sentiment, used a different edge punch, and made a knot instead of a bow on my ribbon. Karen has a tutorial for this technique on her blog here. Thank You...... no ..... Thank Ewe! 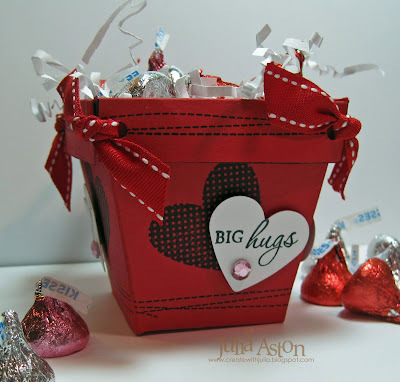 And some Valentine Crafts! What a fun Limited Supplies challenge today over on Split Coast - to use a sentiment that is a Palindrome - the same spelling frontwards and backwards! My palindrome today is EWE - Thank 'ewe' to be specific! And my dotted patterned paper, as required, is the same on both sides should you fold it in half! Even my frame stamp from Waltzingmouse fits the bill - the same on both sides! My 'ewe', from Rubber Soul, is cut out and popped up on foam dimensionals - qualifying this for yesterdays Ways to Use it challenge - cut it out! A fun challenge today - it really made you think!! - and I learned a new word !!! LOL!!! 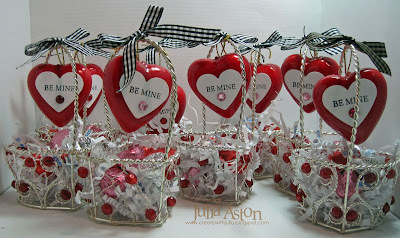 And here are some Valentine Crafts that I made to sell at my church in a few weeks. My sister gave me these cute heart shaped silver baskets -they were left over from a wedding shower that she had for my niece (I think she got them for $1 each at Christmas Tree?). I also had these pretty puffy hearts from a friend who was cleaning out her supplies and no longer wanted them! 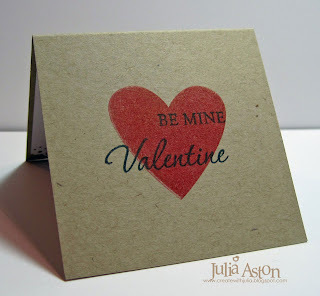 So - I just stamped Be Mine on white card stock - punched it with a heart punch and attached it to the heart which I then hung off the handle of the basket. 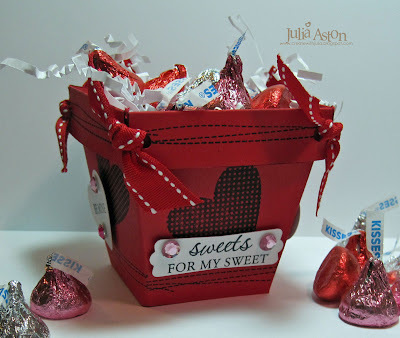 I attached a gingham bow over the knot so it looked pretty and filled the basket with white basket shred and yummy Hershey Kisses! - oh, and I also added a sticky gem to each heart! You may have seen these boxes on this post of mine - this time I put a cute little seed pot inside (the box is called a flower pot box after all!) The seeded pots were 2 for $1 at Target! I made a few of the boxes in pink card stock and put these pretty lucite votive candle holders inside them - again - 2 for $1 at Target! I used this cute little Hedgehog from Penny Black and the Be Mine is from Waltzingmouse. You can find the tutorial for these holders here - and below is a pic of how it looks cut, scored and trimmed! You start with an 11"x4" piece of card stock. Holding the long edge at the top - score at 1/2", 1 3/4", 4 1/4", 5 1/2" and 8". Holding the short edge at the top - score each side at 1 1/4" Use a 1" circle punch for the hole. The long DP panel (shown below) is 5 1/4" x 2 3/8" the shorter piece (attached on the flip side on the section above the circle) is 1 3/8" x 2 3/8"
So that's it for me today! I've been on vacation this week - stamping up a storm as you can see! The week has just flown by but I did get a lot done! Thanks so much for checking in with me today! I was off from work today in honor of Martin Luther King, Jr AND we were kind of snowed in by a wet snowfall last night of about 5" so I took good advantage and made three cards for three challenges! All of them are made with stamps from Waltzingmouse. 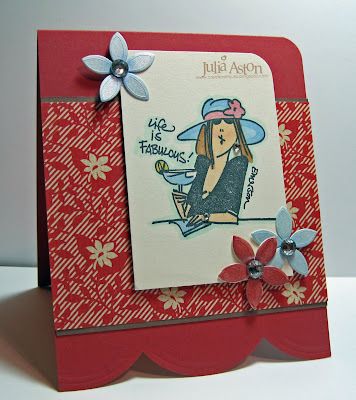 I made my first card for the Mojo Monday sketch challenge. I just got some of this new Beloved DP by My Mind's Eye. It has such great designs and pretty colors! I used the same piece - front and back - on this card. The stamps are from the Sweet Hearts Set. I love the arrows with this set! 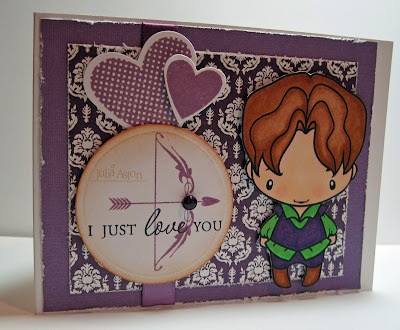 I used oval nestabilities to frame the image and a Spellbinders Ribbon Tag Trio die to frame my sentiment. 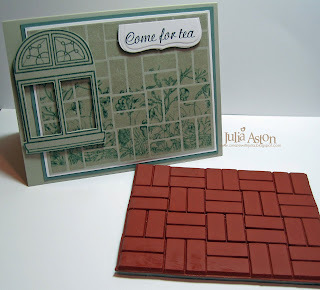 I made my second card using the New Technique challenge on Split Coast - Brick Tile. I have to say I stamped this image on 3 different pieces of paper before I found one that looked good as tiles. But I do like the final result! I popped up each 'tile' on a foam dimensional and sponged the edges of my panel with tea dye ink. These stamps are from the Irish Blessings set. I figure this would make a good masculine 'get well' card! My third and final card today was made for the CAS challenge on Split Coast which was a color challenge - to use Teal, white and one other color on your card. I used a piece of teal designer paper from Stampin Up - overstamped it with the sentiment from Sweet Hearts and added 2 punched hearts! I guess my 'one other color' is black ink! Ok - off I go to get some things done that I didn't get to while I was stampin' !!! You Have a Big Heart, Valentine! 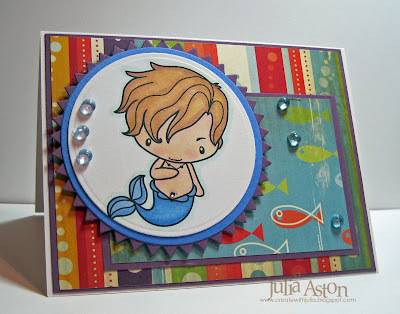 My good stamping buddy Anne (jdmommy) is the featured stamper today! She LOVES red so I knew I had to CASE something using that color. I chose her CAS Red Hearts. 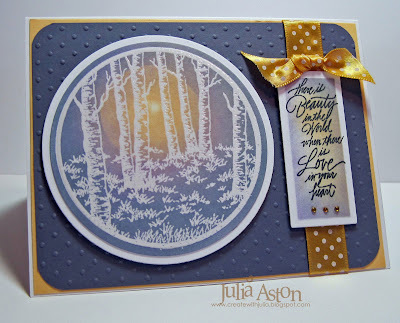 I was on my way to bed Friday night and snuck into Split Coast to check the inspiration challenge - and of course just had to make a card once I got inspired! 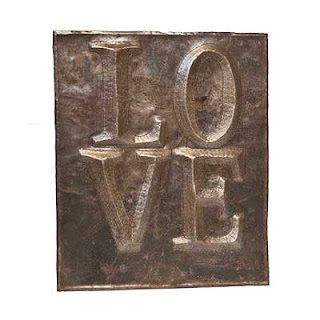 I chose this Primitive Love Plaque from the on line store, Nell Hills, because I knew this stamp from Rubbernecker Stamps was perfect to represent the image! 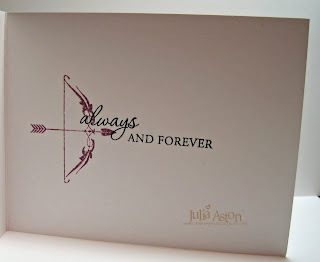 I embossed the image with gold embossing powder on gold card stock. I dry embossed the white card with my square nestability and then adhered the gold piece inside the frame. All you need is love - do da do da do...... sing along with me now!!! Have a great weekend everyone - it's a 3 day one for me as we celebrate Martin Luther King Day. Thanks so much for coming by! Ok - are you ready for this explanation!?!?! I made this long tall recipe book for 5 challenges today! I used 1) this week's SCS sketch 2) this week's SCS colors, 3) Mudder's Tea Pot Challenge, 4) an old challenge from last Oct's World Card Making Day to make something with dimension - and 5) this week's Doubledog Dare challenge from Itsapassion (Anne) to use 4 challenges on your card/project! All the stamps on this are from Waltzingmouse Stamps Please see the links to the sets below. ....and you are welcome to join along with the Doubledog Dare Challenge to use 4 challenges on your card - can you handle it??? put DDC in your keywords on Split Coast if you can!!! 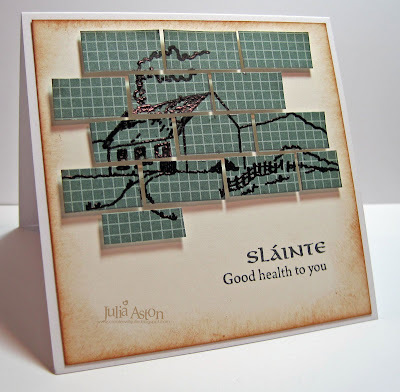 The Clean and Simple challenge on Split Coast this week was to use cut outs on your card. 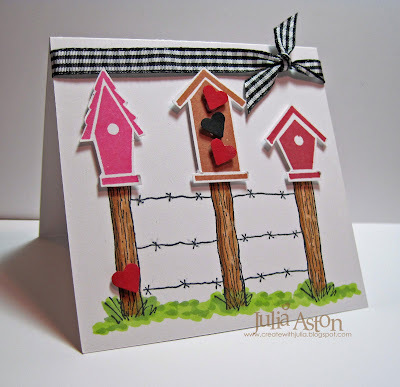 I stamped these cute birdhouses in three different colors, cut them out and layered them onto the posts of this barbed fence. I went over the barbed wire with a clear Spica pen so it shimmers a little IRL. I added a few punched hearts so this could be a Valentine card if I wanted it to be , colored the fence with copics and tied the gingham ribbon around the top to fill in a little bit of the white space! Pretty clean, pretty simple. 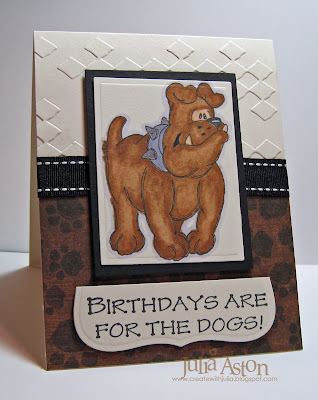 This is Spike and he is just thrilled to be on this Birthday card today - can you see his big friendly smile?!?!? 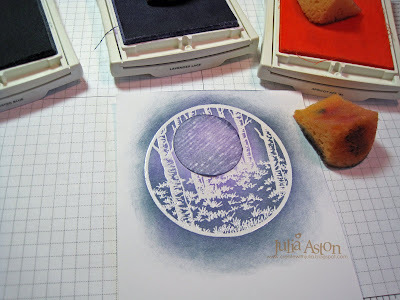 But I always like to do the Featured Stamper challenge over on Split Coast so first things first right?!?!? This week it was WeeBeeStampin. I cased her cute pumpkin Emma card. I made mine a birthday card - used Spike instead of sweet little Emma - changed the sentiment and added a ribbon and some dry embossing. I did use her overall card design. I cut the sentiment using the Labels Eight Nestabilities and just cut it off above the words. I embossed the background with the Diamonds in the Rough Cuttlebug folder. Be sure to check out the stamps over at Rubbernecker - they are all on sale "preinventory" right now!! The inspiration challenge on Split Coast this week was a web site called Groovy Inclinations - a shop full of digital images and altered photos. I just love birch trees and was totally inspired by this image called Manches which you can see in the center of this pic (the rectangle one) along with 3 of my attempts to recreate it! 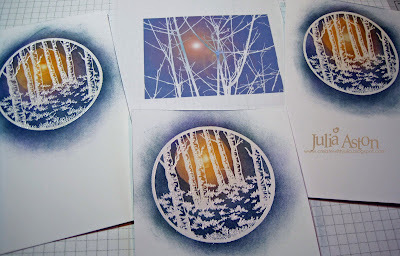 First I clear embossed this lovely Birch Forest stamp on white card stock - then I sponged with blue and purple inks masking a circle for the sun. I removed the mask and added a smaller circle mask and then sponged with appricot and a little purple leaving a white spot uninked in the center. I used a long rectangle nestability to cut the sentiment and sponged it with the same 3 colors before taking it out of the die. And here's my final card - it came out just the way I had envisioned it - and that doesn't always happen!! My stamps today are from Rubbernecker Stamps . Thanks for stopping by today! I always appreciate your comments. 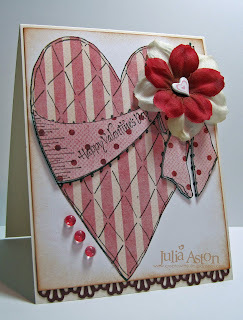 The Limited Supplies Challenge on Split Coast was to make a card for someone you love - using red, pink, white, black and polka dots somewhere on your project. I decided to make this cute little flower pot box designed by Qbee I decorated it with stamps from the new Sweethearts set by Waltzingmouse Stamps I also used the Stitches background stamp from the Off Beat Backgrounds set along the rim and bottom edge of the pot. This also qualifies for Sharon's No Time to Stamp challenge to use Hearts. 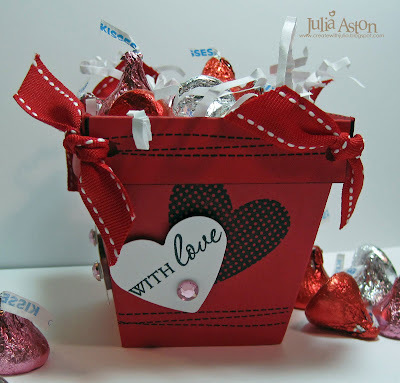 As you can see, I filled my flower pot to overflowing with yummy chocolate Kisses! I could give this to several people I love - my dear husband, my dear son, members of my extended family or some of my good friends! 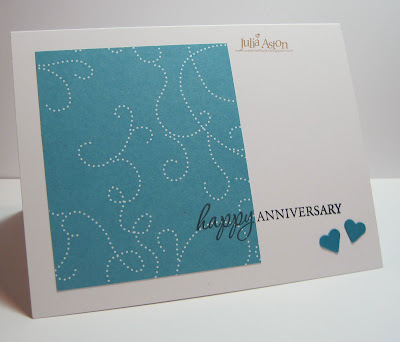 As promised - here is a card using some of my new Rubbernecker stamps - my first as a member of the Design Team! Whoo Hoo!!! The Ways to Use it Challenge on Split Coast was to use something new - how convenient!?! 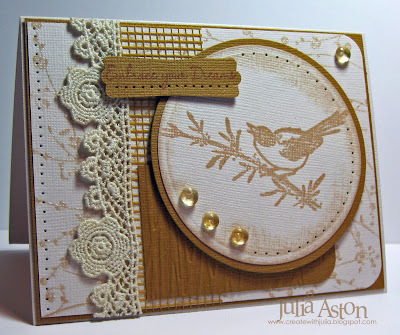 On this card I used the background Bed of Roses, the bird branch and one of the sentiments (Embrace Your Dreams) from the Floral Silhouettes set. I clear embossed the background and the bird on the branch after stamping them with Memento Desert Sand ink so they would show up against the textured Bazzill card stock. I layered a piece of vintage lace over some magic mesh and I dry embossed the mustard panel with the forest branches cuttlebug folder. To finish up - I did some random paper piercing and added a few dew drops as well as the sentiment piece. You can see the sentiment stamping better IRL - I stamped it with Potters Clay ink that kind of blends in -but I tried it in black and it was too stark looking with all the soft tans going on here. Thanks so much for dropping by today! It's FRIDAY!!! What's up for your weekend? 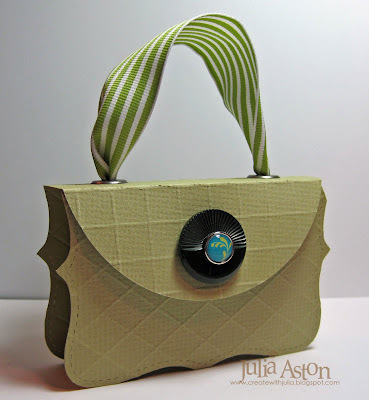 Well - I needed to catch up on several Split Coast challenges - so this little purse covers 4! I used the colors for the color challenge to use celery green, teal and hunter green (the big button IS really hunter green but looks black in the pic!) - It was from my dear MIL's button box and has some decorative groves on the top half of it. And I used the Grid Technique on the Bazzill card stock which was Charlene's (Lilluvsstampin) Doubledog Dare Challenge for us this week. Going shopping makes me happy and that was Francie G's DDC challenge to us last week to make a card or project showing what makes you happy! AND the Mudder's back (YAY!!) with her Tuesday Teapot challenge. We're all going to Dodge City to help Miss Kitty find a new man - I thought that she could use this pretty purse when she hits the streets for the nightlife - appropriately enough, the teal brad on the button is from the Urban Prairie set by Basic Grey! I think Miss Kitty will put her little silver derringer in here in case she needs to ward off any unwelcome advances from certain gentlemen!! It will be cleverly concealed until she has need of it! Hi everyone! I am just over the moon with some exciting news I can finally share with you all. I am now officially a member of the Design Team for Rubbernecker Stamps! Check out the announcement on their blog - there it is in black and white!!! I'll be posting soon using many of the wonderful stamps you can find at Rubbernecker so be sure to check back! In the meantime - be sure to check out the store - there's a great pre-inventory sale going on!! You can also check here to see cards I've posted in the past with some Rubbernecker stamps on them. (you'll see which ones are Rubbernecker in my supplies list at the bottom of each posting. Ok - now that I got that exciting news off my chest - here's a Valentine for you! What a fun Technique challenge over on Split Coast - to make a paper quilt. I layed out my 1" squares of designer papers, glued them to a square of card stock and then cut them with a heart nestability. 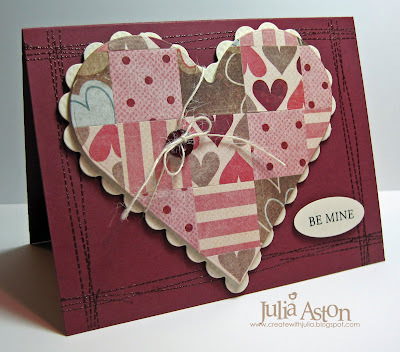 I layered the quilted heart to a piece of cream textured Bazzill card stock cut with the scalloped heart nestability. 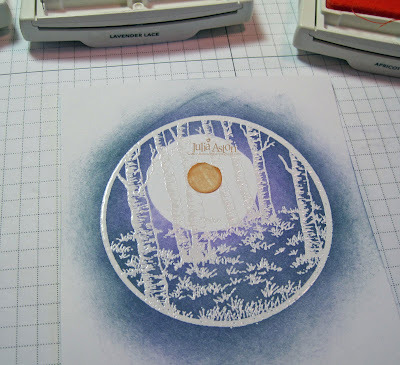 I stamped the stitching from the Waltzingmouse Off Beat Backgrounds set with Versamark and embossed it in clear EP. Then I tied a piece of twine around the heart and added a vintage button. I off set the heart and placed the sentiment in the right corner. Both are on foam dimensionals. 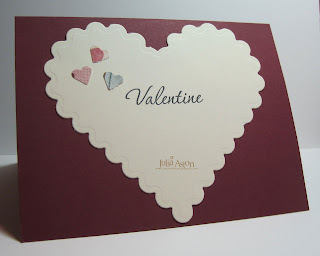 I attached a cream heart to the inside of my card so I would be able to write a salutation and decorated it with a few little hearts punched from the same designer papers I used on the "quilt". 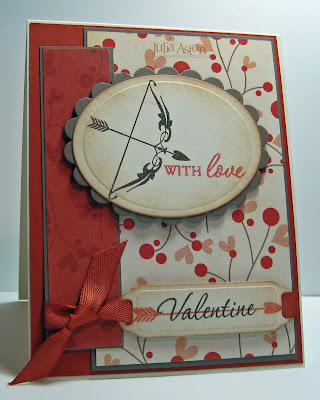 The sentiment is from the brand new Waltzingmouse set called Sweethearts. 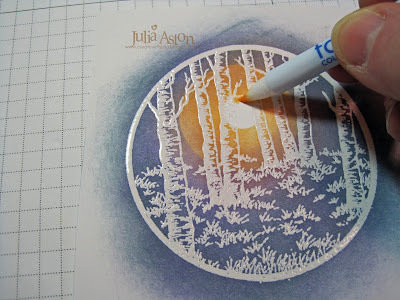 Check yesterday's post below to see more of the beautiful stamps from this set! You can check out all the other Paper Quilt cards here. I hope you'll try this fun technique they're really simple to make! Thanks for coming by today and sharing my happy news! 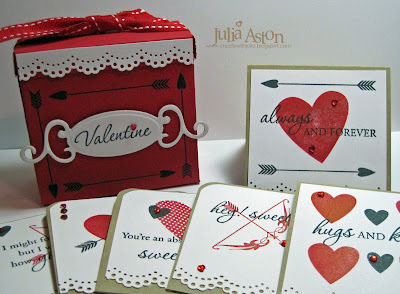 Whenever I get out the red and white paper to make Valentine cards it brings me back to my childhood....... We'd spread out all our heart stickers, doilies and red and white construction paper (remember that?) on the dining room table and go at it! 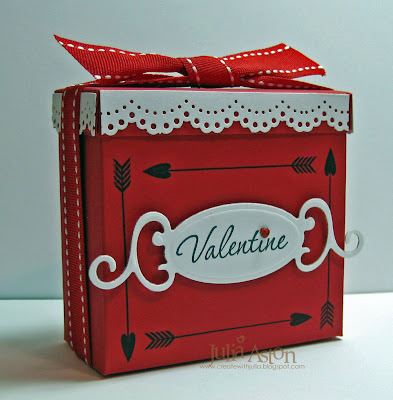 So that's where my thoughts were as I made this sweet little Valentine Box using stamps from the brand new Valentine Set called Sweet Hearts releasing later today from Waltzingmouse Stamps! Here's what the back of my box looks like. 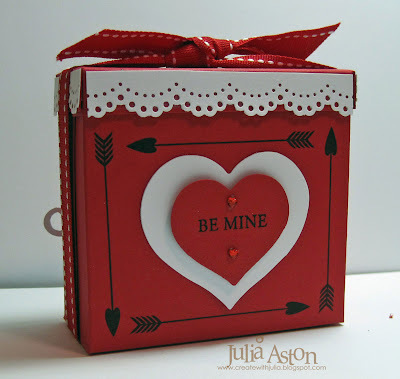 I made 6 little 3x3 Valentine cards to tuck inside the box. I made all the cards with the same colors and papers but used different stamps on each one. Can you believe how many great stamps are in this set??? And I still didn't use all of them! These little cards could be tucked in lunch boxes or left on pillows or car seats. 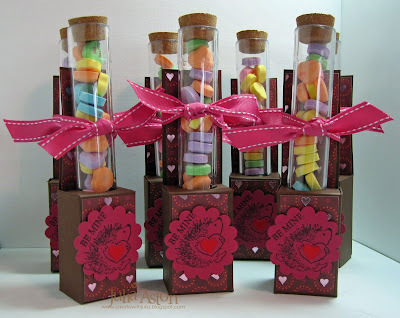 Wouldn't it be fun to be surprised by one of these little tokens of love?! I just love the two arrow stamps with this set. 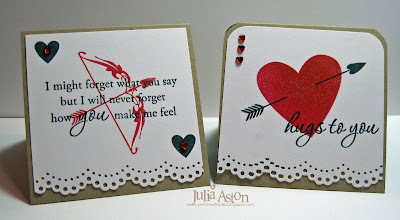 I stamped the same sentiment on the inside of each card - overstamping the red heart. 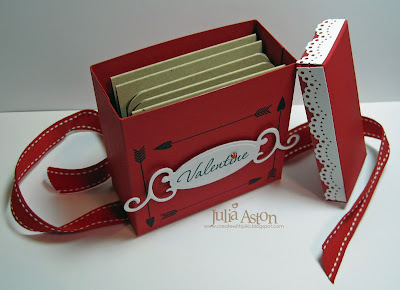 If you'd like to make one of these boxes you can find a tutorial here. 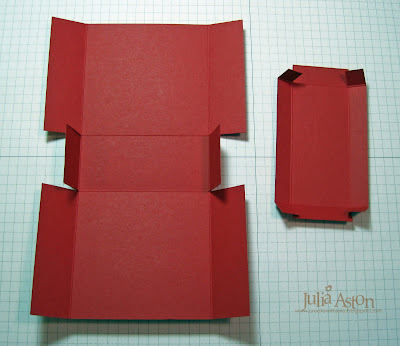 Basically - the box is a piece of card stock 5 3/8" x 8". Holding the 5 3/8" side along the top of a Scor Pal - score on left and right edges at 1". Holding the 8" side along the top of a Scor Pal - score on left and right edges at 3 1/4" Cut as shown below on the left. The cover is a piece of card stock 4 3/8" x 2 9/16". Score at 1/2" on all 4 sides. Cut as shown below on the right. 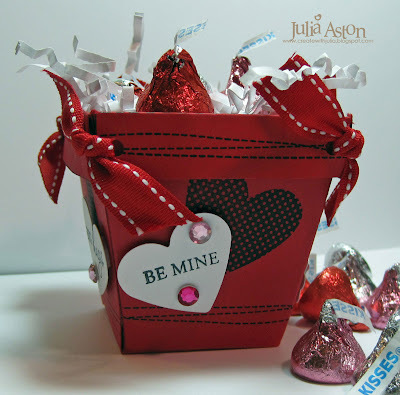 Here's the whole package again - Of course - you could just fill the box with Hershey Kisses - Yum!! 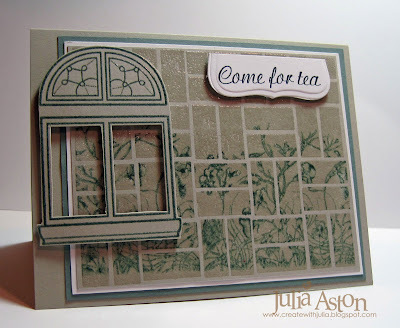 AND - check out Claire's blog for more gorgeous samples using it! She has another new set called Faux Fun that you need to check out too! What are your childhood Valentine memories?? A Fleur de Lis New Year!